Electronics are everywhere. Today’s devices aren’t simply more powerful and Intelligent, they are also connecting across multiple domains, driving entirely new markets. 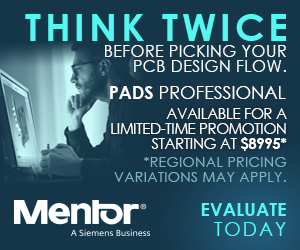 Mentor Graphics brings you the PCB design tools you need to meet today’s complex design requirements. Mentor PCB Design Products – Empowering the Electronics in Everything Revolution – Try it for yourself!! Fill out the contact information and one of our experienced field professionals will contact you.